I love this article written by Josee Caza titled “The Importance of Parent Portraits” on the NAPCP website. I completely agree with her thoughts and sentiments. The two pictures she posted of her Mom brought tears to my eyes – as they made me think of my mom and the handful of pictures that I have of her (less than 5). I have two pictures of my dad and a few of my grandma – and that’s it. Some pictures were lost or damaged and some were just never taken at all. There is one picture (lost) that is etched into my brain; it’s of my mom (a total hippy back then) carrying me in a backpack and standing next to her weimareiner. She’s looking back at the camera and I’m facing the camera (probably about 8 months old). It tugs at my heart because it tells the story of a life that I don’t remember. A young mother living on very little but doing her best for me, her baby girl. I must have looked at it a million times growing up and I WISH I still had it to treasure forever. Of course, I do have one of those “posed” portrait studio images that really doesn’t speak to me at all – why didn’t that one get lost? 🙂 So please, take her advice and remember to save those special captured moments for your children. Here are a couple scanned pictures that I still have…. My grandma and I (1983) and my mom and I (probably around 1979). The emotion I feel from these pictures is overwhelming. 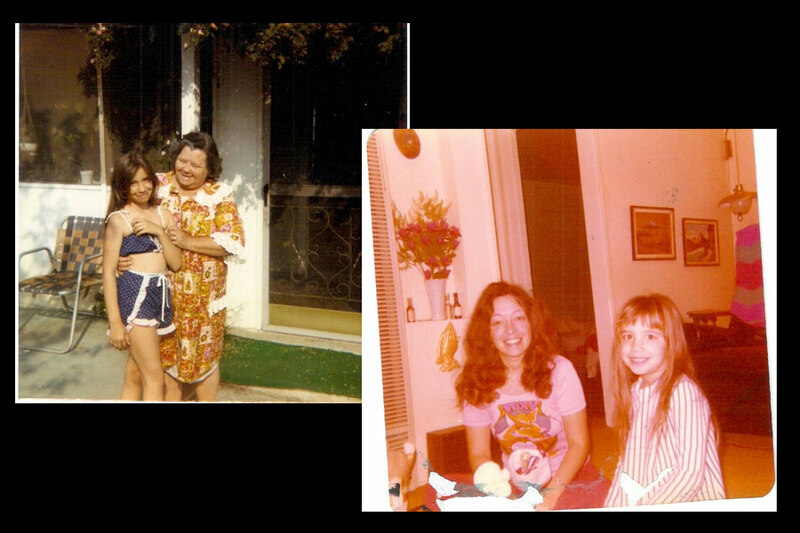 I remember my grandma would always look at ME for pictures and never at the camera (I felt like she was ALWAYS looking at me) and that ridiculous outfit with the wrap-around shorts and belly exposed – I was so embarrassed to wear it! It’s ironic that the picture of my mom and I was also taken at my Grandma’s house (considering she lived 12 hours away and we saw her once every year or two). Her house was the COOLEST place with lots of great food and her doll collection (that I was never allowed to touch). Ahhhh, the memories.